Ready for winter to end? Don’t be in such a hurry! Try out one of these 15 outdoor winter activities with your family and make the best of the winter wonderland! For us, winter used to mean six months of indoors entertainment. We weren’t into winter sports and I could easily find a dozen reasons not to step outside once the temperatures even inched towards the below freezing range. But the past few years have shown me how fun winter can be if you embrace it. Cozy fires, warm blankets, good books, and hot cocoa are great – but they’re even better when you’re waiting for your flushed cheeks to return to their natural color after an hour or two playing in the snow. Outdoor winter activities are also great for bonding and family exercise. Summer may be great for lazy days in your backyard while everyone is lost in their electronics, but no one wants to sit still when they’re outside in the winter. 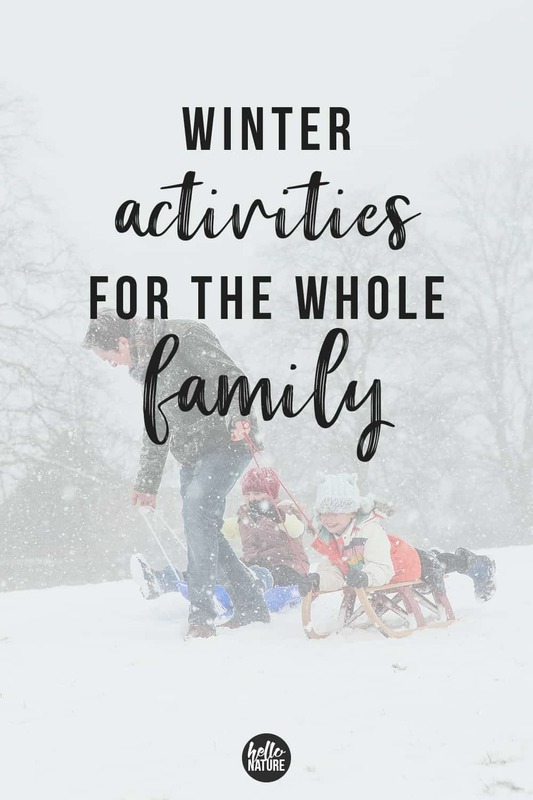 So skip the cabin fever this winter and try out one of these fun outdoor winter activities for the whole family! Doesn’t matter if you’re 6 or 60, snowball fights are fun. They’re also great stress relievers and can ease a lot of family tension. While you can go for a free-for-all snowball fight, you might want to suggest aiming for below the neck so no one gets hurt. Want to make quick, uniform snowballs? Check out these snowball maker molds! Ramp up the snowball fight and build snow forts on opposite sides of the yard. Divide the family into teams and aim from your fort. You can quickly and easily build a snow fort with these brick molds that can be repurposed for sand castles in the summer. Have older kids, teenagers or mostly adults? Rent a snowmobile for the day and hit the trails. You can see some pretty spectacular areas from the trail that aren’t easily accessed without a snowmobile. “Do you want to build a snowman? Come on, let’s go and play!” Skip watching Frozen for the 52nd time this winter and actually go out and build a snowman. Make sure to bring plenty of clothing items to dress it up! Teach your kids about the type of birds likely to visit your yard and help them encourage birds to stop in your backyard. Teach them about feeding birds or make homemade bird seed. You can also make suet and hang it outside. When’s the last time you created a snow angel? Head outside and create one with the whole family. It’s a quick, easy activity that requires little effort! Even the littlest ones can get in on the fun for this. Ice skating can be a great way to stay warm outside in winter! Depending on your area, you may have a couple of options for the location. Safe ponds or lakes or other bodies of water can be dedicated to skating. You can check with your local DNR office to see when the ice is thick enough. Some cities will have manmade ice skating rinks to utilize as well. Be sure to dress warm for the extra wind created as you move. Plus, a little cushion might protect you if you fall! 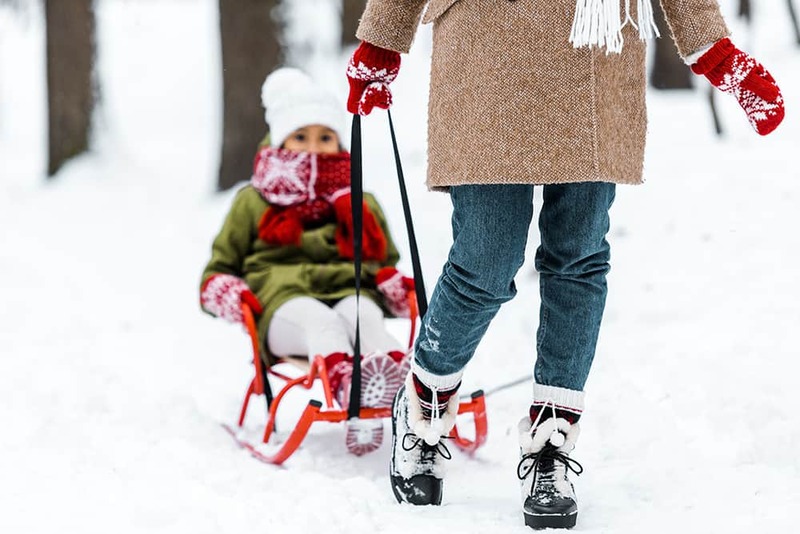 Sledding can be great for all ages of the family! Local sled hills are a great place to spend the afternoon. 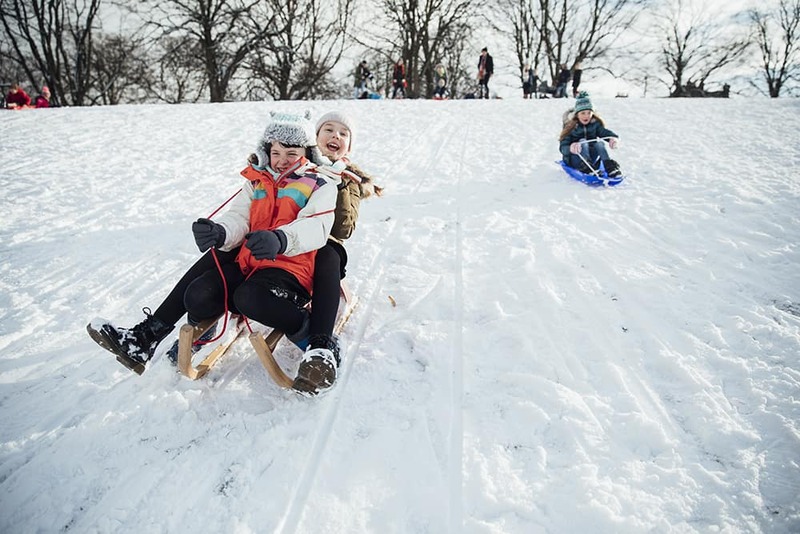 (Be sure to check unusual locations for sled hills – our local one is at a golf course!) If you have a toddler, you might want to check out this baby sleigh – it can be safer and more secure for the little cargo! Snowshoeing is great for family members in a wide age range. It’s one of the easiest ways to maneuver through snow and it doesn’t require much skill to learn. This is the perfect activity after a fresh coating of snow, too! Be sure to check out these reasons you should consider trying snowshoeing. Downhill or cross-country skiing can be great for the family during winter. Consider a full-on ski vacation or even a weekend if there aren’t local skill trails nearby. Again, be sure to check some not-so-common areas for ski trails. The same golf course that our sled hill is at also includes a large cross-country ski trail that’s regularly groomed and many of our favorite local hikes are ski trails themselves or near one. Don’t want to miss out on hiking for the winter? Try winter hiking. Trekking poles are a great option to steady your footing, but that’s the extent of the gear you may need. Other than warm clothing which you’d need for just about any of these fun outdoor winter activities anyway! Bonfires are great in the summer, but they can be even more fun in the winter! Huddling up close with your family and your go-to cold weather drink can be a great way to spend an early winter evening. You’ll actually appreciate the warmth of the fire even more this way! Feeling extra adventurous? Go snow camping! While my memories of camping all involve sunny days and shorts, they also include crowded parks and bugs. It’s a great time to enjoy the bonfire and learn the art of packing light for camping trips. Get the family ready to create a masterpiece with snow painting. All you need is: spray bottles, water, and food coloring. Fill the spray bottles with water, add a few drops of food coloring, place the cap on, shake gently, and then head outside. Mist the snow with your spray bottles and have fun! 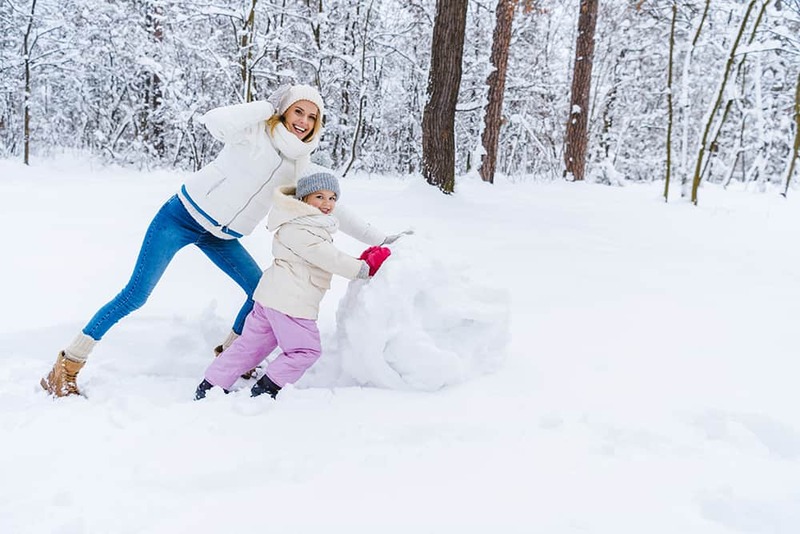 Just be careful – this could stain your clothing so it’s best not to do it where you might be participating in other winter activities with the whole family. Add more sugar if you prefer a sweeter snow ice cream or add a bit more milk to read the desired consistency. And if you want to make chocolate snow ice cream, stir in 2 Tsp unsweetened cocoa powder (this is my absolute FAVORITE cocoa powder, by the way. SO good. It makes the best hot cocoa.) and increase the sugar to 3 Tsp. I hope you were able to find some inspiration in these outdoor winter activities for your next outdoor adventure! Did I miss an awesome winter activty? Be sure to share it in the comments!